There are a lot of job scams advertising what appear to be legitimate positions. Work-from-home job scams are perhaps the most common. 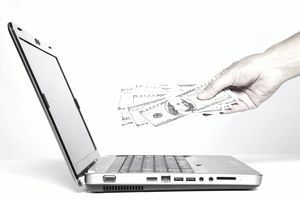 Work-from-home data entry jobs are particularly appealing to scammers, who find many ways to make them seem real. When you hear about a work-from-home job in data entry that sounds too good to be true (for example, the job might promise high pay for very few hours of work), it probably is. Read about some of the most common data entry job scams, and learn some tips for avoiding them. There are a couple of common kinds of data entry scams. One type of scam is the one that will ask you for money. You might be told that if you pay a fee, you will receive a job. Some scams ask you for money so that you can take a required test, pay for administrative fees, or receive equipment or a kit necessary to start the job. Others ask you to pay for a training course or certificate program. Some will ask for money in exchange for more information on data entry jobs. Once you pay the scammer money, you will likely not hear from the scammer again. Or, you will simply receive information that you could have received for free. Another common type of scam involves giving you money – or at least, appearing to give you money. The scammer will send you a check. You will deposit the check and then, a day or two later, the scammer will ask you to send money to someone else (either for work supplies or for some other reason). After you send the money, you realize the check they sent you has bounced. Sometimes these fake companies will drag out the process to make you think they are real. For example, one person who was scammed said the fake company actually put her through a week of “training” before sending her a fraudulent check. Sometimes, these scammers will go as far as to conduct an interview with you – but the interview will not be in person. One reader said she was interviewed by a scammer through an instant messaging platform online. If it sounds too good to be true, it is. Data entry jobs on average do not pay particularly well. Specialized jobs might pay a bit more (for example, jobs as a medical coder or legal transcriptionist). If you see a job listing that promises an extremely high salary, a very flexible schedule, or both, be suspicious. Research any company. Before sending an employer any personal information, research the company. Make sure they have a legitimate website. Ask the employer if you can speak to any of their employees or former employees in person. Keep researching until you feel confident that it is a legitimate company. Never pay money for a job. Many of the scams will ask you for money early on – either to cover the cost of equipment, to pay an administrative fee, or to pay for a test. You should not have to pay money to get a legitimate job. If anyone asks for money, that is a sign that it is a scam. Be wary of paid training programs. There are some legitimate certificate programs or other training programs for specialized careers in data entry, like legal transcription and medical coding. However, many scams promise you training that you either never end up receiving, or training that is unnecessary. Do thorough research into any training program. Ask to speak in person with people who have completed the program. Ask for a signed contract. If you are offered a job, ask for a signed, legal employment contract before beginning work. This will help you ensure that you are legally hired by a legitimate company. Trust your gut. Remember to trust your instincts. If something seems “off” about a position, do more research before responding or reaching out. If you’ve been scammed, report it. If you believe you have been scammed, report it so that others can avoid the same scam. There are a number of ways you can file a complaint, including providing information to the Internet Crime Complaint Center, the Federal Trade Commission, and the Better Business Bureau. You can also report fraudulent websites to Google. There are ways to find real data entry jobs, as well as real work-from-home jobs more generally. First of all, reach out to your connections, including your friends, your family, and your contacts through work. They might know of a company that is looking for someone to help with data entry, or perform some other kind of freelance job. Also try to focus on particular companies that you know are legitimate. This will help you avoid those fake companies that try to scam people. There are also job boards and job search engines that specialize in work-at-home job listings. Of course, you will still need to be on the lookout for scams on these websites. However, these sites also have many legitimate jobs. Real Personal Assistant Job or a Scam?